INTERBRANDS Marketing & Distribution S.R.L. is part of the SARKIS GROUP INTERNATIONAL, with lines of business developed in Cyprus, Bulgaria, Romania, Belarus, Lebanon, Qatar, Iraq and Libya. 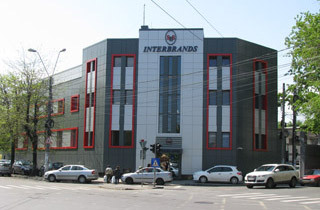 Interbrands is the most important Romanian company in the distribution and marketing of fast moving consumer goods (FMCG) and our goal is to remain at the forefront of the supply chain solutions, providing value and quality to our customers. Established in 1993, the Group is proud to be a trusted national partner and distributor of some of the most well known consumer goods producers worldwide: British American Tobacco, Procter & Gamble, Nestle, Kotanyi, Henkel, PSI, Kraft, Tchibo, etc. Serving customers across the country, Interbrands is the ideal choice to manage the entire supply chain. More than 1200 Distribution cars. Interbrands stepped into the market starting distribution for the US company Procter & Gamble, who was also its first partner. Several other first-tier companies from different market sectors then joined the company. 2007 – New partners (Cadbury) and surpassing the threshold of 1 billion Euro in distributed products. The increase of 37% over 2006 figure is the most spectacular turnover growth of the company, surpassing the 35% growth rate recorded in 2005 vs. 2004. Interbrands reached this point one year earlier than expected through organic growth of the company. 2011 – Partnership with Tchibo (nation-wide). 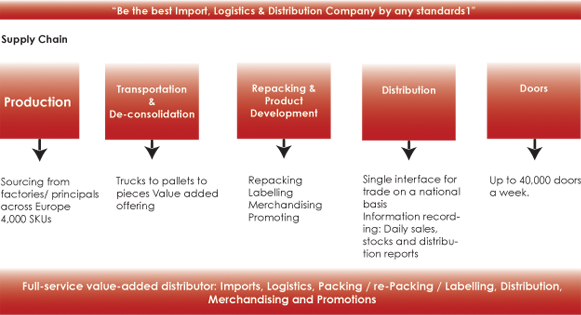 Interbrands offers integrated services for managing the supply chain, covering the entire area of specific activities, from import to logistics, merchandising, promoting, distribution, selling and cashing. INTERBRANDS adopted the strategy of cost reduction introducing business process simplification by providing value - added services, which deliver the expected results to sustain and continue the organic growth of the business, maintaining a competitive advantage. We try to maintain to a minimum the number of third parties that get in direct contact with the products, in order to control the quality of the products that reach their destination: the end customer.